This represents the community spirit of our town. 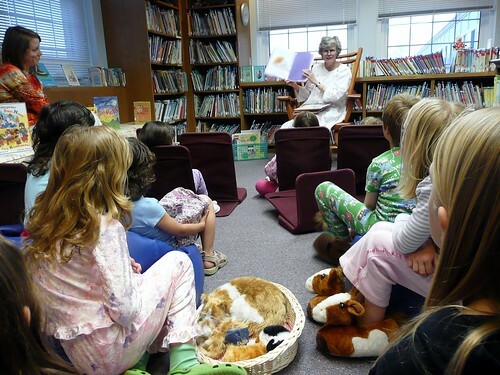 It's our wonderful school librarian, reading to pajama-clad kids during "TV turn-off week." My kids didn't even attend the school at the time but we were welcomed in for an evening of stories before bed. It truly does take a village! Reminds me of the days when there was just one TV in our house, and it was way up in the living room, and our bedtime entertainment was a story read by Grandmama or our Mama. That's a neat thing for a librarian to do for her community.